In case you didn’t pick it up from yesterday’s post, I like to find books in thrift stores. Especially art and craft books. Seriously, those things are so expensive to buy brand new that it is definitely worth having a rummage through the shelves of local charity shops to see what can be discovered. One of my favourite finds was a book called Craft Challenge: Dozens of Ways to Repurpose Scarves by Nathalie Mornu. The trouble was, somehow out of all the scarves that I had hoarded from jumble sales and charity shops, none of them seemed to be quite the right size for any of the projects. So, for the past couple of months the book has sat untouched on my shelf. Yesterday it occurred to me that I could, in fact, perhaps consider using some of the metres and metres of fabric that was sat waiting for a project, rather than wait for just the right type of scarf to show up. An old green velvet curtain, a pair of purple jeans and a scrap of lime corduroy later and I was good to go. 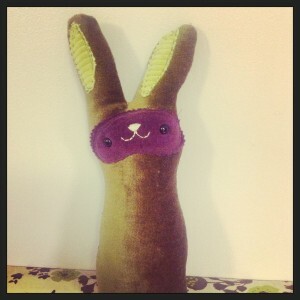 I chose the project called ‘Hoppy’, a rabbit intended to be made out of a wool scarf by the designer Savannah Carroll (visit her blog at sleepyking.net) and set to work. It was so simple that and hour and a half later I had a finished bunny on my hands. Joy! I love it when projects are that quick and simple. Plus I got to try out a couple of techniques that I had been itching to have a go at. I have noticed a tendency towards repeating multiple rounds of top-stitching on appliquéd details recently so I did some of that on the face and ears. I also managed to practise some more embroidery for the nose and mouth. 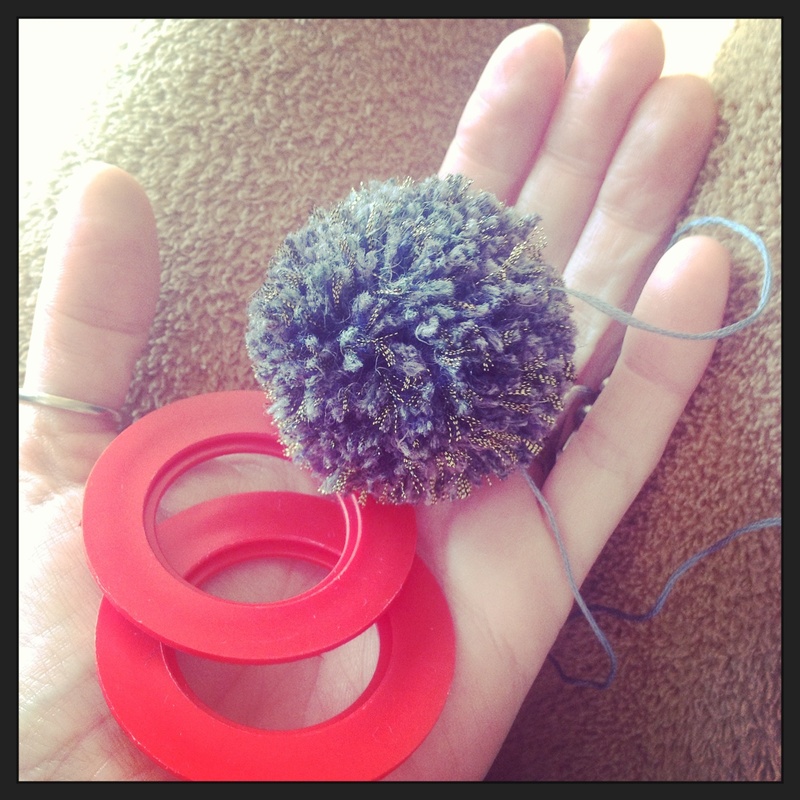 The only real bugbear of the whole project was making a pompom for the tail. Having watched Kirsty Allsopp make one so quickly using the new Clover pompom machine, I find having to go through the whole winding it round a circle thing utterly tedious. I fear my life may not be complete until I have acquired one of the genius gizmos for myself. (Incidentally, I was talking about this on Facebook today and someone has suggested that using a fork might be the solution. Haven’t tried it yet but when I do I’ll report back on how it works out). There is an unwritten rule in this house which goes like this. As soon as I make something cute, especially if it is rabbit-shaped, I can be sure that my girls will want one for themselves. Sure enough, it happened once they clapped eyes on my new creation. 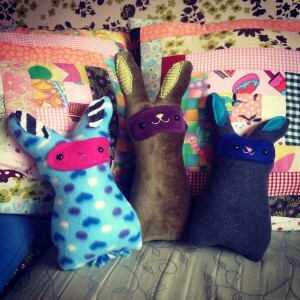 However, because it was so simple and such a joy to make, I let them make it themselves. Two fleece scarves were quickly acquired and though some supervision was needed for my youngest, they had very little trouble knocking up their very own happy bunnies within a morning’s work. Even, better since they had used a scarf with fringing, they could follow Savannah’s advice to cut that into shreds, pile it together, tie it tight and use that as a pompom, which meant no further wrestling with the dreaded circles. Hurrah! 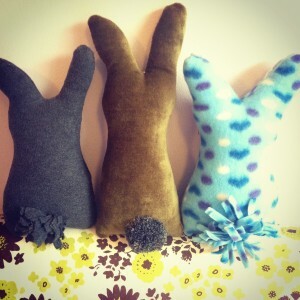 Posted in Blog and tagged Bunny Love, sewing, Toys.